The Israeli army have shot over 3000 protesters in Gaza in the last few weeks with live ammunition including press, medics and many children. They have killed over a hundred. Amnesty International have called for an international arms Embargo with Israel. Gaza a population that is mostly children, under Israeli siege and suffering 3 major bombing campaigns in the last ten years, under Israeli military occupation for 50 years and according to the UN will be in a state that is “unliveable” with only 5 percent of water fit to drink and denied electricity by the Israeli authorities for 21 hours each day. 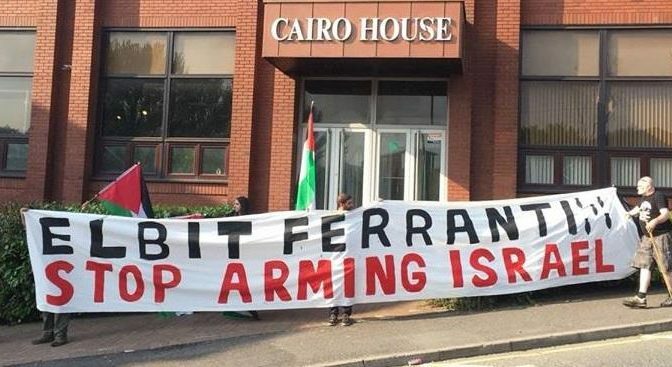 We will be releasing a Report on the Activities at the Elbit Ferranti Factory and announcing the forming of a new Oldham Peace Group who could lead on the campaign in Oldham, with support from groups in Manchester and beyond. There is a demonstration planned on 7th July in Oldham for the 4 year anniversary of the Israeli bombings of Gaza in 2014 that killed 2200 people including over 500 children in 50 days. The public meeting will have a discussion and Q & A. Please invite anyone who may be interested.